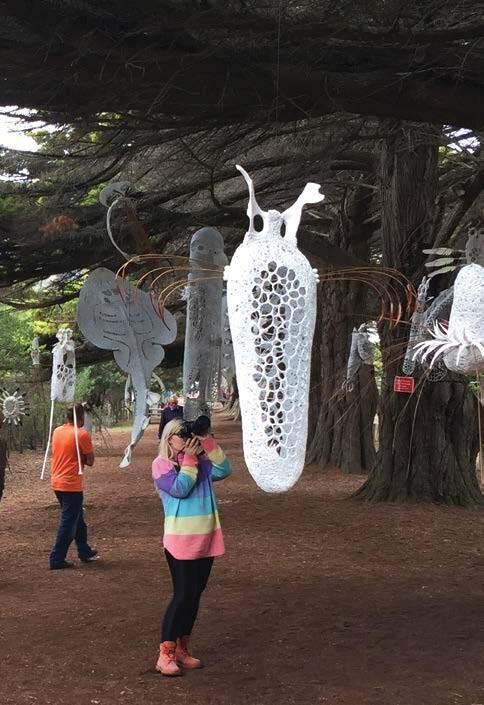 The Lorne Sculpture Biennale was founded in 2007 and with over 60,000 visitors attending the 5th Biennale last year, the event was pronounced an unmitigated success. The Curator, President and Committee now invite artists from across the globe to participate in the 6th Lorne Sculpture Biennale , ‘LANDFALL’ nature + humanity + art, which will take place between 17 March and 2 April 2018. The Curator says, “we seek works that explore the intersection of nature, humanity and art and the pressing global issue of environment and endangerment.” Seven spectacular sites along the Great Ocean Road, home to one of the greatest natural wonders of the world ‘The Twelve Apostles’, have been identified for artists from the Land Art movement to exhibit within, allowing artists to weave their magic within the landscape where it will compete with nature at its radical best. There are a further twe20nty sites along the sculpture trail in and around Lorne where the Great Otway National Park meets the Southern Ocean and where artists will have the opportunity to entertain, inspire and enlighten visitors to engage with art at a deeper level. The 6th Biennale will incorporate a new Performance Art initiative, which explores the great theme of biodiversity and endangerment and will include an endangered music and culture program that specifically targets the Oceanic region of Asia Pacific. While the sculpture trail hugs the coast, all performance events will be staged in a natural amphitheatre along the banks of the Erskine River, which provides an evocative and deeply spiritual setting for both entertainment and reflection. Visitor numbers will exceed 70,000 for the 2018 Biennale with artists receiving wide exposure for their works as well as sales, grants, generous prize-money and residencies among the local community. The closing date for the Expressions of Interest has been extended to now close on Friday 10th March 2017.